Our dogs and cats can’t speak, but they can communicate well with body language. If your pet is hunched over and reluctant to move, she may have a back or disc problem. In this article you will learn what the most common signs, symptoms and causes are of back pain in our pets. You will know when you should see your veterinarian, or when you can be treating your pet at home with some of my advised home remedies. Our pets suffer from back pain much the same way that we do. The signs and symptoms are varied, but are there some very common ones you should be aware of. Your pet may be arched, having a very stiff posture. Many dogs present as reluctant to lift their head, and yelping when picked up or having their neck turned to the side. More serious signs include paralysis, or partial paralysis, loss of bowel and or bladder control. The causes of back disease is many, from soft tissue injury to more serious disc prolapse paralysis. Trauma, or infection can inflame the muscles of the back, leading to marked pain and discomfort- this is commonly referred to as a back spasm. 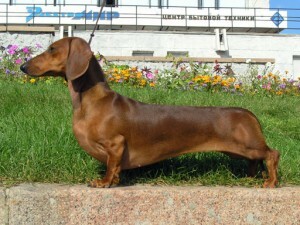 Back pain is particularly common in low, long dogs, such as Dachshunds. We also see it in the highly active dogs that do a lot of jumping, such as Border Collies. A intervertebral disc prolapse can lead to signs of nerve damage: folding toes under the foot, wobbly walking, inability to wall ( paralysis). If your pet is in severe pain or has signs such as wobbly walking, or partial paralysis, it is a situation for your veterinarian. This type of back condition is considered an emergency. Your pet will have X-rays, potentially other diagnostic tests (ie MRI), and may be a candidate for surgery. The big point here is not waiting- immediately see your veterinarian, and having surgery ASAP, for this provides for a better prognosis. Fortunately most cases of back and disc disease in our pets are treated medically- and this means that many of the holistic options can help. Using cold and heat as a compress; the type of compress depends upon the injury. For a sudden injury accompanied by inflammation, ice is helpful. Apply a block of frozen ice wrapped in a towel for 15 minutes 2-3 times daily for 2 days. Some clients finding using frozen ice in a popsicle stick works well, or the synthetic bags for people. When the injury is more long-term, then applying heat is more appropriate. Wrap a hot water bottle in a towel and apply it 2-3 times a day for 15 minutes to the affected area. Capsaicin is the active ingredient in chili peppers that makes them hot. Capsaicin is used in medicated creams and lotions to relieve muscle or joint pain. Capsaicin used on the body causes a sensation of heat that activates certain nerve cells. With regular use of capsaicin, this heating effect reduces the amount of substance P, a chemical that acts as a pain messenger in the body. It can be used topically for local painful joints for both dogs and cats. Ginger extract may help with joint and muscle pain because it contains phytochemicals, which help stop inflammation. Few side effects have been linked to ginger when taken in small doses. Fresh ginger works well steeped in boiling water as a tea or grated into vegetable juice. Magnetic therapy has begun to be recognized as being very helpful for back pain. A company called Nikken makes a very high quality magnetic pet bed. No one is completely sure how it works, but thousands of people can attest to its effectiveness. Another use is to apply a small healing magnet to the BL60 acupressure spot. This is the spot located on the side of your pet’s hock. Leave the magnet in place for 1-2 weeks. Ask your veterinarian about obtaining a healing magnet. Muscle relaxants can greatly help- both conventional and natural. In practice I often advised clients to use Robaxin ( methocarbamol), the dose being 15-20mg per kg 3 times a day. That would mean a 45lb dog( 20kg) could take one 500mg tablet every 8 hours. A holistic option to consider is Valerian, which also helps with muscle spasms. The valerian dose of the tincture is 0.1 ml per 10 lbs given twice daily. Lastly you need to be looking at what you can do to prevent this from happening again in your pet. Glucosamine hydrochloride is the most important supplement to add to your pet’s diet. The dose is 100 mg once daily per 10 lbs of body weight. It helps to rebuild the cartilage and delay further cartilage breakdown. It can come in a variety of combinations. An effective one is my own dog and cat supplement, Dr. Jones’ Ultimate Canine Health Formula and , Dr. Jones’ Ultimate Feline Health Formula. Glucosamine should be given in combination with chondroitin, as this supplement may improve the effectiveness of glucosamine. Pet back pain can be treated, and you should now be aware of the common signs and symptoms: arched back, reluctant to move, unwilling to lift neck. If your dog is showing severe pain, or any sign of paralysis, immediately see your veterinarian. If they are less severely affected, then consider some of my top, effective natural home remedies: cold compress, capsaicin, ginger, magnetic therapy and muscle relaxants. I need as much help as possible with my 4 year old mixed Chihuahua. She is only 4 years old and suffered a fall which paralyzed her back legs and tail. She’s going through laser treatments, and periodic hot water bottle treatments on her back. She is on Metacam for pain and inflammation, and tramadol for pain.